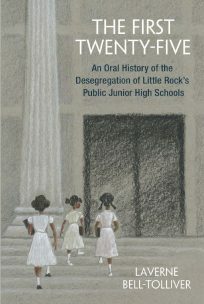 The community is invited to three free public events that mark the release of Anderson Institute Faculty Associate Dr. LaVerne Bell-Tolliver’s book “The First Twenty Five: An Oral History of the Desegregation of Little Rock’s Public Junior High Schools.” The events feature a discussion including the author and fifteen participants who were interviewed for the book, audience Q&A, and a book signing. Books will be available for purchase and light refreshments will be served. See event dates and locations below. This program was made possible in part by the African American Heritage Grant of the Arkansas Humanities Council, a Social Justice Grant of the Second Presbyterian Church, and the UA Little Rock Anderson Institute.